Discussion in 'Android Devices' started by FRESHCMB, Dec 30, 2014. NAH, BUT THE FUTURE OF THE NOTE.. DO YOU THINK THE NOTE SERIES WILL EVER BE "WATER PROOF"?? OR IF A FIRE FIGHTER WAS TO HAVE ONE... WILL IT EVER BE FIRE PROOF OR HEAT PROOF???? I think water proof is not an impossibility. People say it's not possible because of the stylus, but I don't get it. The stylus compartment can be made completely separate from the rest of the phone. That's no excuse. As for the stylus itself...perhaps there's a water issue there. I'm concerned that the Note series, and the Galaxy series for that matter, may come to a rapid end. Xaomi and other up-and-coming brands are producing very capable phones and undercutting Samsung's premium prices. Sammy is taking a bath in its mobile division, and it's a very real possibility that their mobile phone division will eventually shut down rather than continue to take heavy losses. Mobile division chief J.K. Shin took a 50% paycut last quarter (still over $500k/quarter so it's hard to feel sorry for him), and this quarter wasn't much better. Add to that problem Samsung's insistence on using their own Tizen OS instead of straight-up Android and you're mixing up a recipe for disaster. I foresee a day coming very soon when the Galaxy S6 or 7, and maybe the Note 5, will be the last phones to roll off Samsung's lines before they stop making phones altogether. You think the Android maker with the largest market share will just stop making phones? The void would be enormous to fill. Not to mention, all the names on that chart aside from "Other" sell phones for the same prices as Samsung. 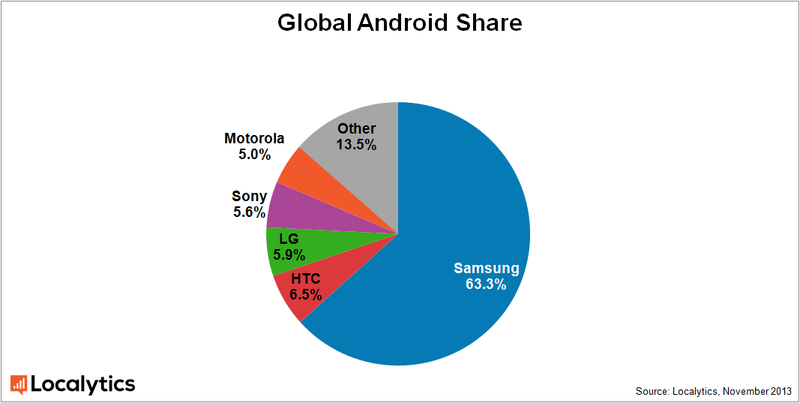 I realize this data is 1 year old, but I don't think the shape of the pie has changed too dramatically since 2013...Samsung's slice has probably shrunk, and everyone else's has increased, but it probably looks the same overall with a crap load of blue on the right side, and a little bit of color on the left. First, why are you writing in CAPS? I think Samsung will continue to lose some market share. I think we will see a big redesign to touchwhiz in a couple years, either the S6 or S7. I think Samsung will start to concentrate advertising their midrange phones if the S6 doesn't meet sales expectations. I read where they already canceled the Galaxy Alpha series. I'm sure waterproofing technology will get better and better so I look for that to be a standard across the industry soon. I think they will put more money into tablets, at this point everyone I know young or old has a tablet. I don't think Samsung will leave phones soon: their mobile division still produces 10 times the profit of their consumer electronics division, just a lot less than a year ago. What can I say? The smartphone market is saturating, developments are become increasingly incremental, so why would anyone not expect this to happen sooner or later? There's a lot of talk of this shaking Samsung into some new designs, but I'd not be surprised if the result is less radical than people assume. As for tablets, if everyone has one then that's no longer a growth market either (though I should note that I personally don't own one so far). For me Samsung's big advantage there is the S-Pen, but I don't know how important that is for most people - I could use it for note-taking or some types of presentation, but if you mainly use the tablet for browsing or watching videos I can't see it being very important. But there is going to be increasing competition in that market too: at the high end Sony are producing some nice devices, and there are rumours that HTC will produce a device of their own on the back of the Nexus 9. And if we ignore the real budget end, the Nokia N1 could prove interesting at the lower end: very much like an iPad Mini only running Android and with a price similar to or below the Nexus 7 and a brand name that many people still recognise. The only consolation there is that Xaomi et al don't seem to have turned their attention to tablets yet, but that sector will end up commodified even quicker than phones is my guess (and without the contract subsidies to drive upgrades I suspect the replacement cycle will be slower). Samsung stopping phone business? Not even a slight chance in any foreseeable future. Despite all these news media, blogs talking S5 being flop, their sales taking plunge and all that, it's mostly Samsung device when I see people using non-Apple device in their hands. I saw some HTC, LGs too if not Samsung androids. Let's hope you're right. I'm already saving up for a Note 5 DE. I love the Note series, and the unlocked Developer Edition is the greatest! I still stand by my prediction: Samsung makes EVERYTHING... in fact, I just ordered a brand new set of Samsung HE washer & dryer. While the company won't go away any time soon, I still believe that Samsung's phone division is taking a massive hit. Maybe it's that Samsung phone division saw an unexpected leap in growth and sales, and they're being adjusted back to normal by outside influences. But whatever it is, I'm more than a little concerned. "Chinese smartphone maker Xiaomi has become the world's most valuable technology start-up just four years after it was founded. The firm raised $1.1bn (£708m) in its latest round of funding, giving it a valuation of $45bn, which surpassed the $40bn value of taxi booking app Uber. It has quickly risen to the ranks of the world's biggest smartphone makers, behind Samsung and Apple in sales." Things can change very rapidly...watch this space. It wasn't so long ago that Nokia was one of the world's most popular phones, and now look what happened to them. ....in China especially this year through personal observation, I'm seeing many more people with Chinese brand phones than Samsungs, especially Xiaomi, as well as Vivo, Oppo, Lenovo, Gionee, Koobee and Meizu. In this country(China), flagship Samsungs like the S5 and Note 4 can be rather expensive compared to their domestic counterparts, like Oppo F7 or Vivo X5. Apple on the other hand are considered a luxury brand here, and iPhones can be very much a status symbol, and they do very well, thank you very much. I don't think Samsung has quite the same position. Samsung makes phones in all price ranges. Competing directly with Chinese brands. KOLIO and The_Chief like this. These global conglomerates make many products, we've got a Panasonic printer in the office, while a friend of mine does his business on a Panasonic toilet. Hitachi TVs used to be very popular and well regarded, they don't make TVs now, but the elevator in our new apartment block is Hitachi. If Samsung's mobile division starts to lose money(which could happen). Unprofitable divisions are often sold off or sometimes closed down. IBM selling their PC division to Lenovo, and IBM invented the PC. Though Xiaomi's recent rise seems impressive, people tend to overlook their sales is limited to China and India mostly. I read somewhere they are still making over 90% of sales in Chinese market. If you look outside China, especially North American and European market, their presence is almost nothing. Not even close to LG, HTC, Sony, let alone Apple and Samsung. They still have a lot to prove to enter the major Western markets yet. Even for Samsung it took many years to get where they are with US carriers, government. There are still concerns, doubts on security, support on their phones. Also it doesn't seem Xiaomi is well prepared for legal battles either. For Samsung, mobile division is still their biggest money maker though their profit decreased last year. They won't give that up without putting up strong fight.